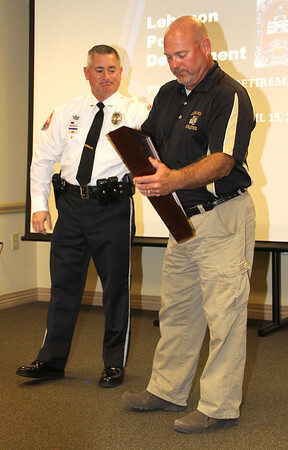 EARNED RESPECT: Former Lebanon Police Department Chief Sam Myers (right) receives the flag flown during his watch over the department from current LPD Chief Tyson Warmoth at a retirement and promotion ceremony Friday night. It's police tradition to retire the officers' firearm and give them a retied badge with their number, and Myers received both. Warmoth said Myers, a 27-year LPD veteran, had accepted a new position with the Boone County Prosecutors office, and may become a reserve detective with LPD. "I've had the honor of working under Sam on the shifts and we share a few war stories we cannot unfortunatley share," said Warmoth with a laugh. "I hope Sam will acept the position with us and continue to serve the City of Lebanon."